After eating at Sheep Station, my friends Jess and Garrett recommended that we get a slice of pie at Four and Twenty Blackbirds. They both raved about it, particularly about the salted caramel apple pie. To our dismay we found the shop closed, and we continued on our way. I mentioned it to Donny, and we decided to go there one day. A few days later I was at Prospect Park when I got a text message from Donny: “Pie at black birds?” By the time I got there, though, one of the servers was crossing out the flavors of pie that were no longer available. In fact she was crossing out ALL of the pies, including “and more’ except one: buttermilk chess pie. 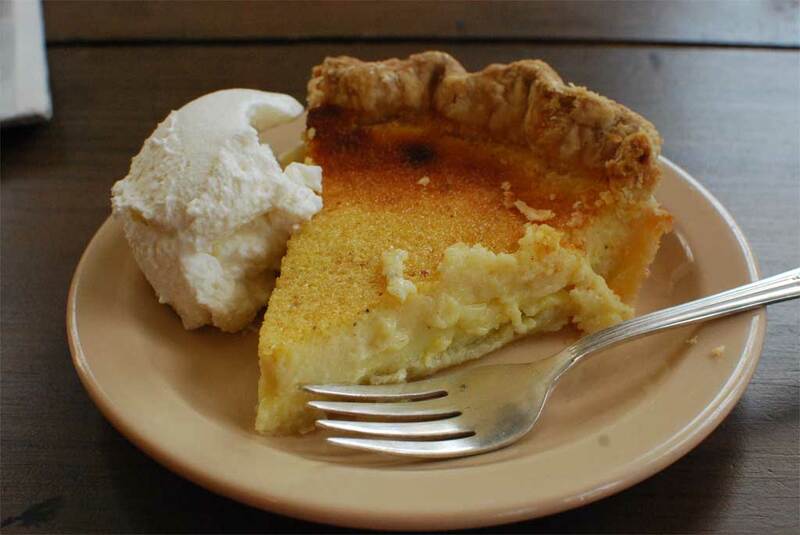 What is “chess pie”? I had to look it up afterward. Apparently when you add cornmeal to a pie filling, that makes it a chess pie. It has absolutely nothing to do with the game of chess. In any case, I wouldn’t have been able to tell that there was cornmeal in the filling. It was rich and custard-y, and slightly tangy from the buttermilk. It kind of reminded me of the filling in a cheese danish, and I love cheese danish. There was also a dollop of whipped cream, which was super light and airy, and not very sweet. I though the crust was a little on the chewy side, but that’s just nit-picking. Donny: I really liked the place. It was airy and had a high ceiling. The chess pie was deeellicious! I love any sort of custard-y things and I agree with Howard about the crust. It was quite difficult to cut through the crust but of course we did go toward the end of the day.